We are continuing to look for volunteers for our Canoe Hire Project and the Sunday and Tuesday work parties. We have been fortunate in gaining some new volunteers from our kayak and canoe customers, but we can always do with more for a variety of tasks. All volunteers are welcome to join us in a range of capacities to suit all abilities. We are glad to report that Whitehorns Day Centre continues to join the work parties on Tuesday with the service users and their support workers. The Waterways Recovery Group visited us once more in 2018, working on the Ynysmeudwy Upper Lock bywash and the Trebanos Locks. This work continues and we will be hosting a further camp in August 2019 at Ynysmeudwy Upper Lock. Opening the piped sections at the old Highways Depot and Trebanos Playing Fields is a priority for us, and discussions are taking place whenever possible to pursue this goal. 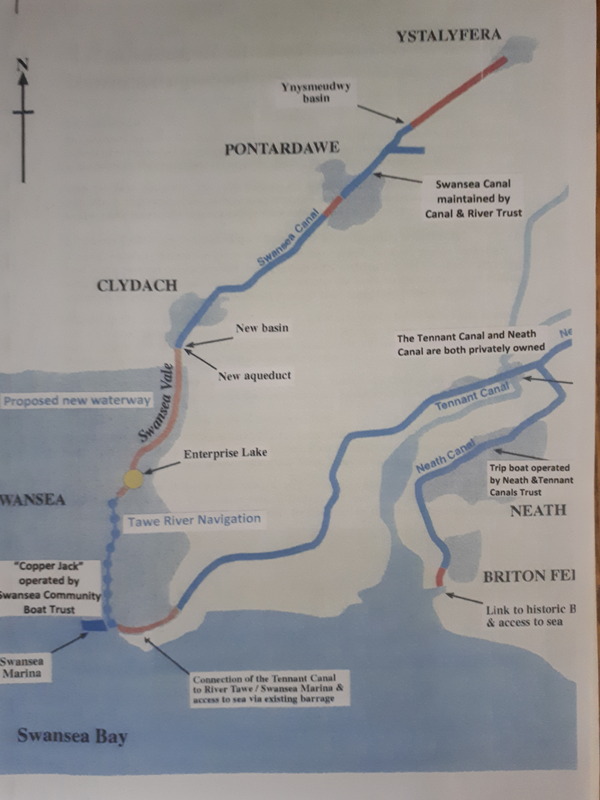 The City and County of Swansea have now generously donated the route of the canal through the Old Highways Depot to the Swansea Canal Society. Our first aim was to restore the towpath there and this has now been done. It is part of Sustrans National Cycle Route 43. We also hope to achieve opening the piped section between Pontardawe and Trebanos. Linking the Swansea Canal and the Neath and Tennant Canals. It continues to be a long term aim of the society to link up these three canals to enable a stretch of over 35 miles of canal to be navigable. We try to ensure that any section of the old canal that can be reinstated is not threatened by building plans, which would prevent restoration. 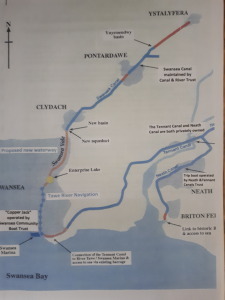 The proposed route of the new canal linking the Neath, Tennant and Swansea Canal. More details and photos on all of the topics above are available on our blog pages (Click on the list to the right). Hi there. Just wanted to send you a comment as once again today I brought a group of young people to have a go on the canoes. Your volunteers were very helpful as always and accommodating to the young people. It’s great to have the canal as a resource near swansea. Great for wildlife and such a pleasant environment to spend some time in. It would be fantastic to see the canal fully restored and dredged to allow it to be used by canal boat, canoe and for all the other benefits that a canal can give to visitors and the nature. Thanks you so much for your comments, Mark. We hope to have the canal dredged up to Trebanos Lock in the near future but we have several hurdles to leap before it cna happen. Do bring your groups to the canal as often as you can. I would dearly love to see all three canals linked once more. I think the work you are doing it brilliant and my husband and two teenagers hope to join you one day over the summer holidays to help on a work party. I do want to ask however, now Newcut Road and the copper quarter have been built over where the canal once was… How are the canals are to be linked? Would a new route be proposed? I think if they do all get linked the tourism and revenue from bringing this back would be fantastic! Not to mention the nature! Thank you for your question and welcome comments. As a result of it, I have added a map of the proposed new route to link the three canals to the ‘Ongoing Projects page’. To sum it up as briefly as possible, the Prince of Wales Dock in Swansea is the focal point of the link. An extended Tennant Canal enters the Dock from the East and the Swansea Canal enters from the River Tawe into the dock in the west. The Swansea Canal would run on the east side of the river as far as the Fendrod River and then into the River Tawe above the LIberty Stadium. Thence along the river into the POW dock. A new part of the canal would have to be built through the Llansamlet Enterprise Park to the Fendrod River. As you so rightly say, there is no chance of the Swansea Canal being rebuilt on the west bank of the Tawe as it did originally.